Since becoming a mama, I have seriously tuned into my self-care routine. It's not that I didn't take care of myself before, it was just that I had so much more time and so much less responsibility. Now, not only I need to really focus in on fitting in my self-care each day, it has also become non-negotiable. The Standard Spa - Last week I booked a babysitter, bought a day pass to the Standard Spa in Miami Beach and spent the afternoon schvitzing in the hammam and drinking green juice. Even though it was just a few hours and only a couple of miles from my house, I felt like I was on vacation. I love the hammam at The Standard, but any spa or health club will do. Boxing Class - I love trying new fitness classes and recently discovered Fitbox, a great Miami boxing studio. The boxing class makes me feel stronger and also helps me to release built up tension. Green Juice - Sipping on a cold pressed green juice gives me an instant burst of energy. Make sure to look for cold-pressed, non-hpp, with no fruit (read:sugar), just veggies! for the best results. 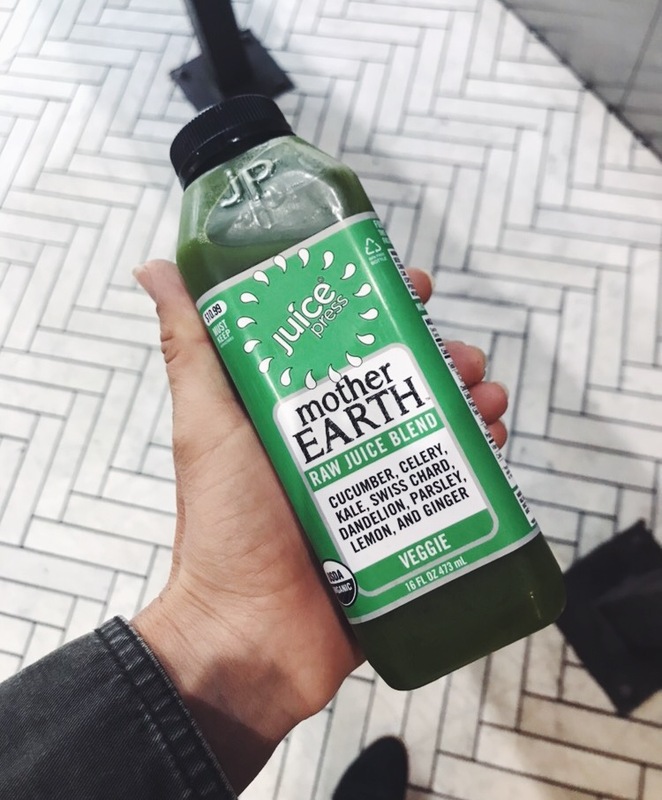 My favorite juice ever is the Mother Earth from Juice Press. In Miami, I love GreenG's Adjust Yourself and the Dr. Smood's Organic Green Juice No. 5. Legs up the wall at LAX. It's my favorite, I'll do it anywhere. Legs up the wall - this is one of my favorite things ever. Whenever I am tired or stressed or anxious, I lie on my back with my legs up the wall for several minutes. It completely melts away any negative emotions and I feel revitalized after. Send energy to your core - I have been working with a coach who has me practice sending all of my energy to my core whenever I feel upset or angry. This has been an incredibly powerful exercise that I turn to throughout the day. It is also a good excuse to get in your TA Squeezes 😉. Add a massage - When I lived in New York, I used to add on shoulder and leg massages to my mani-pedis. It was a great way to release a little tension without having to commit to a full hour+ for a massage. The practice isn't as common in Miami, but I finally found someone who will do it. Texture - I schedule time each night after my daughter goes to bed to tune out of emails and tv and read. Texture is great because you can read all of your favorite magazines in one place. My faves: New York Magazine, The New Yorker and O, Oprah.